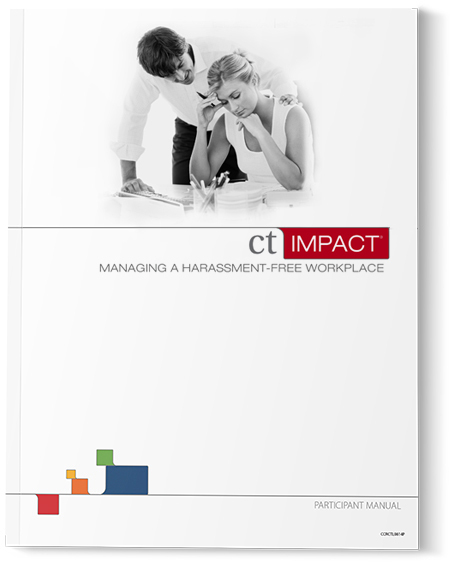 CT Impact®: Managing a Harassment-Free Workplace helps managers develop the necessary skills to prevent sexual harassment, communicate expectations about workplace conduct, recognize and respond to problematic behavior, and maintain an environment where employees are comfortable bringing forward concerns. Using ELI’s proven learning methodology, CT Impact: Managing a Harassment-Free Workplace teaches practical skills through an interactive, experiential format: thought provoking videos, realistic workplace scenarios, memorable behavioral guidelines, and skills-building exercises. This course reinforces concepts introduced in Civil Treatment® for Leaders and provides an enhanced understanding of the business risks of sexual harassment. In addition, it meets the training requirements set forth by state law in California (AB 1825), Connecticut, and Maine. CT Impact: Managing a Harassment-Free Workplace is available as a two-hour instructor-led program, as a webcast, or as a two-hour or one-hour online program. It can be taught by ELI’s professional instructors or your own ELI-certified instructors. New in 2017, the online version of CTI now features a first-person immersive approach, in which participants must handle a variety of business challenges in a simulated workplace.